DNA (deoxyribonucleic acid or deoxyribose nucleic acid) is the very large molecule in chromosomes that carries the genetic code. Its shape is a double helix -two cross-connected strands twisted together. It is a self-replicating material which is present in nealry all living organisms as the main constituent of chromosomes. The side strands are made of alternating sugar and phosphate groups; cross-strands are the paired bases. The only difference between nucleotides is the base they contain. The pairs are held together by weak hydrogen bonds, which thus hold the two anti-parallel (chain of nucleotides have a 3 carbon/ 3'/three prime at one end and a 5 carbon/5'/five prime at the other) strands of DNA together. 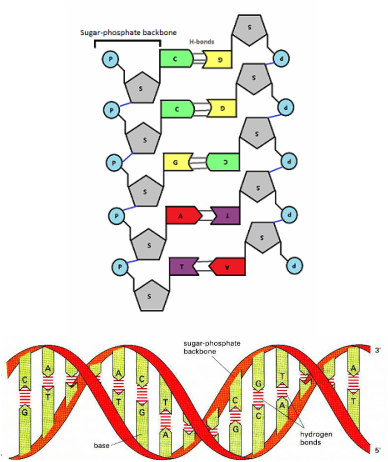 The genetic code is the sequence of bases along one strand (the template strand). A sequence of three bases, a triplet, codes for an amino acid; amino acids are the building blocks of proteins (e.g the triplet GCA on one strand codes for the amino acid arginine). All the triplets that code for one complete protein make up a gene. A gene is the length of DNA that has the code for a particular protein (or polypeptide) which determines a characteristic. A molecule of DNA can have thousands of genes. Different sequences of bases along a gene can produce proteins that are slightly different (e.g one base sequence in humans codes for blue eye colour while another codes for brown eye colour). Different forms of a gene are called alleles. It is essential that DNA can replicate itself, so that chromosomes can be copied to give the same genetic code to every new cell that is made, to ensure that any new cell has the instructions to grow and carry out its essential life processes. It is the base pairing mechanism that allows DNA to replicate. Replication occurs in a series of steps, each controlled by enzymes, with energy supplied from ATP. 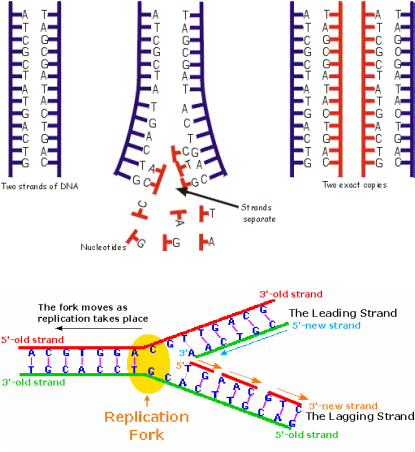 Two identical DNA molecules result from replication, each having one original strand and one newly synthesised strand (formed from nucleotides made by the cell), known as semi-conservative replication. DNA helix unwinds (caused by enzymes). Hydrogen bonds between the base pairs break, "unzipping", which exposes the base pairs. Nucleotides from within the nucleus assemble opposite each strand, bonding to the exposed bases (complementary bases to make a complementary strand), using energy from ATP to join together. Because of the way deoxyribose and phosphate molecules are joined to each other along the DNA chain, one strand (the leading strand) is continuous, bonding directly down the entire length of the 3' to 5' strand. The other strand (the 5' to 3', or lagging strand) is copied in short fragments, known as Okazaki fragments, which are joined by the enzyme ligase to form a continuous strand. Many different sections of DNA are copied at the same time. New nucleotides (made in the cell) bond to the corresponding base (A-T, C-G). The two DNA molecules formed are identical. The new molecules wind into their double helix. The DNA helix is opened at many sites along the whole molecule for simultaneous replication in both directions- this makes replication very rapid. Each opening becomes a replication fork and replication can proceed in both directions from the fork, making the process very rapid. DNA replication occurs prior to cell division (mitosis and meiosis), in what is known as interphase in the cell cycle. In this phase, the chromosomes are long unravelled threads of chromatin. In the early stages of mitosis the chromatin condenses to form chromosomes, coiling up tightly into looped structures made of two chromatids joined by a centrome. The cell cycle, or cell division cycle, is the series of events that take place in a cell leading to its division and duplication. It is a vital process by which a single-celled fertilized egg develops into a mature organism, as well as the process by which many cells are renewed. A cell spends about 90% of its time in interphase. The cell grows, carries out essential processes and biosynthetic activities (e.g protein/enzyme synthesis; ATP production), and gains nutrients needed for DNA replication and mitosis. During G1 of interphase the cell prepares for division and copies organelles. In the S phase the cell's DNA is copied in the process of DNA replication. The G2 phase ensures that any errors in the chromosomes are repaired and the cell is ready to proceed before it moves in to the next phase of the cycle (mitosis). The cell cycles from interphase to mitosis to interphase to mitosis. Cells divide by the process of mitosis for growth, and to replace worn or injured cells. simple cell division, mitosis, produces two daughter cells genetically identical to their parent cell, so that the same cell functions and processes continue. Mitosis takes place most rapidly when new cells are forming during periods of growth, such as in the zygote, embryo, infant and young organism, or in plants coming out of periods of dormancy, e.g seeds germinating and seedlings growing, or buds, leaves and flowers forming in spring. In plants, the tips of roots, stems and side branches are the growth points where mitosis is most rapid.Mitosis occurs in plants most in spring and early summer, to make new cells needed for growth. A high rate of mitosis is needed for the growth and repairs of tissue, for example when cells in human bone marrow, lymph nodes and dermis of the skin divide rapidly to form replacement cells. Some areas of the body are constantly producing new cells. In these places, the mitotic rate is greater than in other areas of the body. For example, the dermis of human skin is constantly active, forming new cells to replace those lost daily from the epidermis; bone marrow constantly produces red blood cells, which remain in circulation for only about 100 days before breaking down; areas of tissue damage (e.g a wound, broken bone or skin). The rate of mitosis is further influenced by factors such as temperature (affecting enzyme activity), the availability of essential nutrients such as phosphorus (needed for DNA replication), and the presence of mutagens (mutation promoting chemicals) and/or carcinogens (cancer-causing chemicals). Each new cell has the full (diploid, 2n) number of chromosomes so that each new cell has a complete genetic code for correct development and functioning. If the code is incomplete, the cell is unlikely to be able to carry out essential processes. Although mitosis is a continuous process, certain stages have been recognised and given specific names. The cell grows and organelles are replicated. DNA replicates so that the chomosomes can replicate to form two chromatids. Chromosomes shorten and thicken. Nuclear membrane disappears. The chromatids are held together by centromeres. Spindle fibres develop from the centrioles. Centrioles duplicate and move to opposite poles, forming spindle fibres. The spindle fibres twist and turn the chromatids, attaching to the centromere, lining them up randomly along the cell equator. The centromeres split, and sister chromatids are pulled to the opposite cell poles, pulled by forces acting on the spindle fibres, by contracting. The chromatids arrive at the cell's poles. Nuclear membranes begin to form around each group of chromatids. The plasma membrane begins to constrict between them. Spindle fibres disintegrate. Both daughter cells are diploid. The daughter cells will grow (interphase), then repeat the mitotic process again. The cytoplasm divides (cytokinesis) between the two nuclei so two new "daughter" cells are formed. On completion of telophase, the two new cells have "chromosomes" because they are now cells in their own right. They have exactly the same number of chromosomes as each other and as the parent cell, and identical genetic material. Stage of life: Mitosis highest in cells undergoing growth and repair (i.e during infancy and puberty, the breaking of dormancy and germination in seeds, or following damage to the organism when repair of tissue is neccessary). Availability of nutrients and energy: Mitosis requires energy, enzymes and certain substances in order to buuild new organelles and cell components. Replication is slowed or prevented or slowed if these nutrients are not available. Location of cells: Mitosis occurs fastest in areas where most growth or replacement of cells is occurring, such as root/shoot tips, hair follicles, bone marrow, skin cells, mucous membranes etc. Environment factors: The process of mitosis (and DNA replication) involves enzymes. Therefore the rate of mitosis is affected by factors that affect enzymes. These factors include temperature, pH and salt (high levels of salt ions denature enzymes and some ions behave as essential enzyme co-factors or toxins).